Spoil your sweetheart(s) with these adorable and delicious chocolate peanut butter snack bites! These are the perfect companions to a Valentine’s Day-themed school lunch or for an after school snack that is sure to wow your kiddos. Of course, if you make these for your grown up sweetie, I’m sure she or he won’t mind one bit. These decadent bites are such a scrumptious treat. The sprinkles are totally optional, if you’d rather use dried cranberries or strawberries to add some festive colour, that would be pretty (and good) too. We’re pretty fond of these kind of balls, bites, bars…whatever you decide to call them. The combination of oats, honey, peanut butter and chocolate is pretty fantastic and really does the trick when you’re craving something sweet. I used melted chocolate chips in this recipe (which have sugar in them), but you could also use cocoa and melted coconut oil instead, lessening the sugar content further. Either way, they are a yummy treat. Tell me, do you celebrate Valentine’s Day in a big way? We never miss an excuse to have a little party, so we like to celebrate as a family with a few sweets and usually a special movie and fun crafts. Maybe you’ll add these to your Valentine’s Day festivities this year! If you do, let me know what you think. Melt in the microwave or over double-boiler 1/2 cup of chocolate chips until melted, but not hot or boiling. Stir chocolate into the peanut butter, honey and add oat flour. Add in remaining chocolate chips. 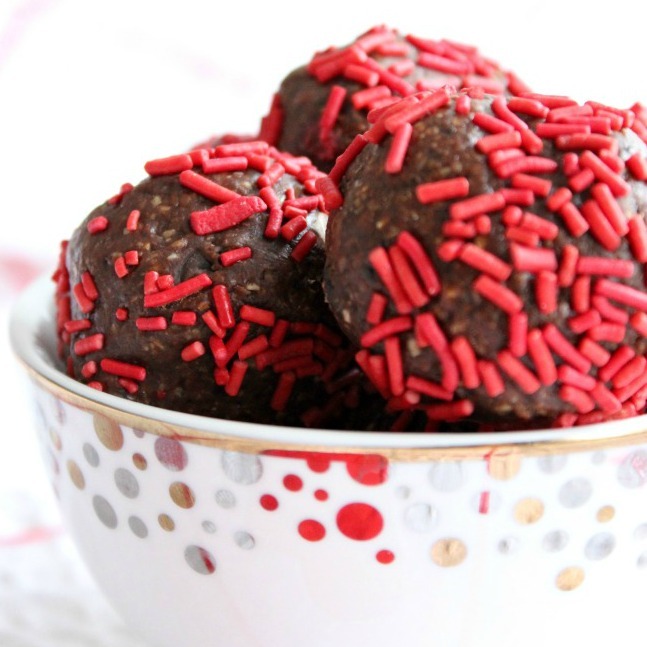 Drop each ball into a small dish with red sprinkles. Roll until somewhat covered. Place on waxed paper lined plate in the fridge for 20-30 minutes. Enjoy! What a cute Valentine’s (or any day!) treat!! hmm this seems like something really tasty…. i will try it. I wish there were a photo of the inside so I know if I did it right. 🙂 Pinned in Recipe section. Thanks! These sound really good, and a lot easier to make than I thought, I will have to give these a try! !